Sierra Leone diplomatic mission in Nairobi, which also serves as permanent representative to the United Nations Office at Nairobi (UNON), the United Nations Environment Programme (UNEP) and the United Nations Human Settlements Programme (UN-Habitat), has confirmed that its staff and all Sierra Leoneans based in the Kenyan capital were safe and sound. This confirmation was made by Peter Joseph Francis- Sierra Leone High Commissioner to Kenya and Permanent Representative to the UNON, UNEP and UN-Habitat, during an exclusive phone call interview with this writer in the evening hours of Tuesday, 15th January, 2019. The confirmation from Ambassador Joseph Francis about the safety of Sierra Leoneans in Nairobi came as Kenyan authorities released massive security in their capital- Nairobi -after suspected al-Shabab militants’ attack at Dusit D2 Hotel, 14 Riverside Drive, Westlands, Nairobi, killing five (5) people and three (3) causalities currently admitted at the Age Kahn Hospital in Nairobi. On his efforts thus far in checking on and ensuring the safety of Sierra Leoneans in Nairobi, Ambassador Francis said sooner he got the information about the attack, he got the entire staff of the High Commission in Nairobi in a single building that is electronically protected. He further confirmed that the Deputy Sierra Leone Special Representative to the United Nation (UN) in New York, Madam Victoria Sulaiman, who was attending the UN meeting on the Environment, was at his residence at 158 Mimosa Drive, off Mimosa Road, Runda, Nairobi, doing fine. 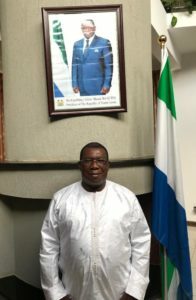 He noted that he was worried about the welfare of a single Sierra Leonean whose office was said to be in the same building that was attacked, but that his family informed him that the said man was out of Nairobi on business trip. So far, he said every Sierra Leonean in Nairobi was safe and sound and that the High Commission, situated at 57 Gigiri Court off UN Crescent, Gigiri, Nairobi, Kenya, has already resumed operation.